Lean-to buildings are the perfect solution for those without enough space for a free standing building. 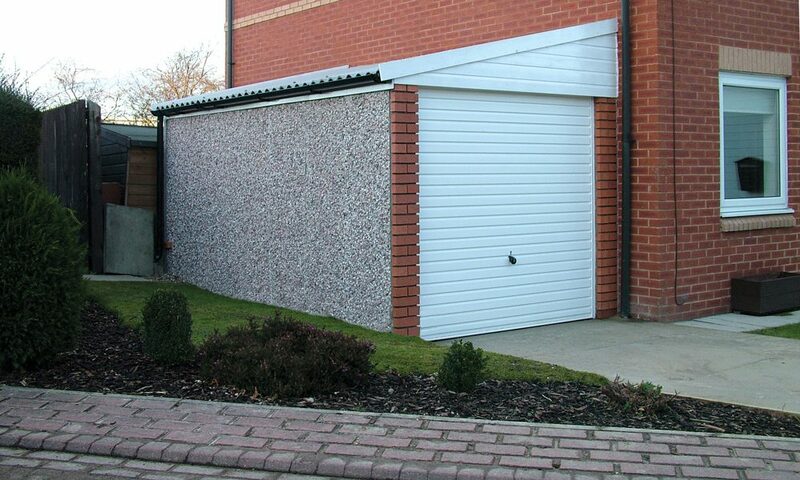 Our Lean-to garage range can be constructed from any of our five building shapes: Pent, Pent Mansard, Apex, Apex 15 or Apex 20 and act as the ideal garage extension. Flat roof for economy, Mansard for a different look, or choose from the three Apex roof designs – we believe there is something for everyone to complement your house. Because of the individuality of every site, we build these lean-to buildings to order, after asking you for specific site details. We have to make sure that we know of the exact position of windows, doors, vents, pipes etc, and we will ask you to confirm these details on our lean-to paperwork. (Please note we do not fit flashing to the house wall, this is the responsibility of the owner). The end result is something that is not only eminently practicable, but will add value to your home as well. Talk to your agent, ask for our Design&Build service, or email us for more. Apex: 14′ 3″ (4.34m) – as long as you want. Dependent on building shape chosen. Lidget Compton are unique in offering GB patented Brick and Stone Wall finishes, which make your lean-to a real part of your house. Garaclad PVCu cladding, in a choice of White, Cream, Light Blue, Light Grey, Sand or Enviro Green. You can choose the best to blend with your house. As the main view of your lean-to is from the front, why not look at our Real Brick front posts and massive range of Main Door options to personalise your building.